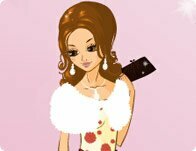 Description: Get down with your friends with this fun fashion game! Share your spirit and show off your style! Instructions: Use your mouse to click on and through the floating clothing, hair, background and accessory options for both of these dancing friends.